Reaching Inner City communities through cross cultural youth ministry. Picture the scenario. It’s the semi-final game in a soccer tournament. You are trailing by one goal with less than five minutes left in the match. You’re tired. You’re hurting. You have fought every step of the way, but just can’t score the equalizer. You leave nothing on the field, but the final whistle blows, and you can’t secure a win that would send you to the final. As the opposing team celebrates a hard fought victory, you sit in the grass, head down, while the brilliant rays of a golden sun slowly fade into twilight. In that moment, you have to somehow put aside the disappointment of losing the battle, and turn your focus onto what is going to be shared with the other team. With tears in your eyes, you have to stand up in front of guys that have been cursing and hurling racial slurs at you the entire game, and share about Jesus and One7. It’s easy when you win. it’s a completely different story when you lose. We don’t win every game or tournament we participate in, so it’s inevitable that this situation will happen. There’s really no way to prepare for it. You go into every match thinking you will secure a victory. Not out of arrogance or pride, but with a sense of confidence in your self and the other members of your team. The guys you sweat, bleed, and fight with on the soccer field. Your brothers. Your family. Our teams face persecution nearly every single game they play. It comes in many different forms. Other players cursing at them, purposefully trying to injure them, or just repeatedly tossing racial remarks in their direction. As hard as it is, our guys don’t retaliate. They play respectfully and with great sportsmanship. Then win or lose, they stand in front of their persecutors and share the Gospel. There have been some amazing, life-changing stories that come out of sharing with the other teams. God gave us the best Heaven had to offer when He gave us Jesus. We owe it to Him to give our best in everything we do. This entry was posted in One7 and tagged argentina, bible, Charlotte, christ, community, ethiopia, faith, family, god, jesucristo, Jesus, love, one7, outreach, salvation, soccer, story, vietnam, volunteer on March 10, 2014 by one7blog. As we go through life, we often miss the everyday needs of people all around us. We see desperation the most when we deliver food or clothing to apartments, where so many families are in need, . The last two days, One7 has delivered all the wonderful clothing and shoes, that so many people have generously donated, to a nearby apartment complex where many refugees live. When you drive in, it’s like entering a third world country. The moment anyone realizes that you are giving anything away, they come running. It’s not like what you see on the news, where people are trampling over one another to get the best deal on a laptop for Christmas. This is out of sheer desperation to gather warm clothing for their family. As soon as we started handing out clothes, everyone’s arms were reaching out, trying to get at least one article of clothing. Others were pushing their way through, trying to get closer to our trailer for a glimpse of hope and love. When our donations were all gone and there was nothing else to give, some of our leaders even took the jackets off their backs and gave them away. Part of what we show our kids at One7, is even when their life is hard and their family is struggling, there is always someone else hurting and struggling more. We are to be the His hands and feet to those who don’t know there is a living God who loves each and every one of them. That’s how God uses us, to show the world His love. This entry was posted in One7 and tagged bible, Charlotte, christ, community, faith, god, inner city, jesucristo, Jesus, love, ministry, outreach, salvation, story, volunteer, work on December 27, 2013 by one7blog. Wow, what a weekend. We entered five of our One7 teams into the Charlotte United Under Armour Cup. Five teams, twenty games. It’s stressful and chaotic enough when we have one team in a tournament, much less five. Paperwork, player cards, socks, balls, and whatever else were finally secured at some point in the wee morning hours on Saturday. First game was at 8am. We utilized our three 15 passenger vans, one 12 passenger, one Nissan Altima, and one Doge minivan for transportation. It was pretty crazy. We don’t just enter these tournaments to win games. Yes, to bring back a trophy for each team would have been nice, but we play for a much higher purpose. These events give us the opportunity to share Jesus with people we wouldn’t normally meet. After each game, one of our players shares with the other team about One7, God, and gives a brief, personal testimony. We also present the opposing team’s best sportsmanship player a Man of the Match award, which is normally an iTunes card. It’s always fun to watch their faces when we do that even after losing a game. God uses our testimony on and off the field to touch people. After sharing, a lot of times the parents from the opposing team will give us gift cards, gas cards, and sometimes even cash donations. These are always vital because a tournament of this size isn’t cheap. Even if it doesn’t look like we will have the money to cover gas, entry fees, equipment, food, drinks, and everything else, we enter the tournament anyway, believing that God will provide a way. People are so moved by what they see and hear from our youth that they can’t help but feel burdened to help in some way. Our U16 team made it to the final but lost to penalty kicks after fighting through a full match and two overtime periods. The parents of the opposing team clapped for and then hugged all of our players as we walked off the field. It was amazing to witness. These people, these strangers, see something in us, and they are drawn to it. Out of our five teams, the U14’s won the final and were able to bring home a trophy. This was our U16’s team first time playing together, and they almost knocked off the number one team in the tournament. These boys aren’t just learning about winning and losing in soccer. The lessons they learn will carry over into their lives as they continue to become men. As all of us at One7 will tell you, it isn’t anything we are doing. God is using this ministry in ways we could never have imagined. We follow God and trust that He will always have our back. We would like to give huge THANK YOU to everyone who came out to the various games to support our teams. That means more than you will ever know. Also, a special thank you to anyone who has ever donated money, time, or prayer to One7. We appreciate it from the bottom of our hearts. We will leave you with some pictures from this weekend’s tournament. Hope you enjoy. Make sure to follow One7 on Twitter and/or Facebook by clicking on the appropriate link to the right. Thanks! This entry was posted in One7 and tagged argentina, bible, Charlotte, christ, community, ethiopia, faith, family, god, inner city, jesucristo, Jesus, life, love, ministry, one7, outreach, salvation, soccer, story, vietnam, volunteer, work on November 18, 2013 by one7blog. Now we could end the blog post right here, and there would be many people nodding their heads in agreement. Let’s define our definition of normal. Work 9-5, Monday through Friday, and then take off the weekend. Yeah…One7 is most certainly not normal. This is a 24/7, 365 kind of ministry. God continues to bring the broken and hurting to our doorstep, and we will do whatever it takes to help them. This past weekend was full of activities. Our One7 team from Johnson City came into town and brought the biggest group yet. Their limitations were put to the test with some Navy Seal training. We’re not talking about a few push ups and a jumping jack or two. This is some serious, hard-core training. Running a mile with a ladder raised above their heads, 200 sit ups while holding the same ladder and being sprayed with water, lifting, moving, climbing over/under railroad ties, and several more events. These activities not only teach vital team work, they also push each individual to their breaking point. They fight through the fatigue and pain to eventually finish the course. We also had a total of five soccer games this weekend. The purpose of the One7 soccer program is to provide kids, who have little or no resources, a chance to compete at a high level. We seek to utilize these teams as a way to train up leaders who can then go into their own communities and become an influence for positive change. We also use the game to bridge the gap that exists with racial barriers. By intentionally building diverse teams, it forces players to work together with people from different nationalities. 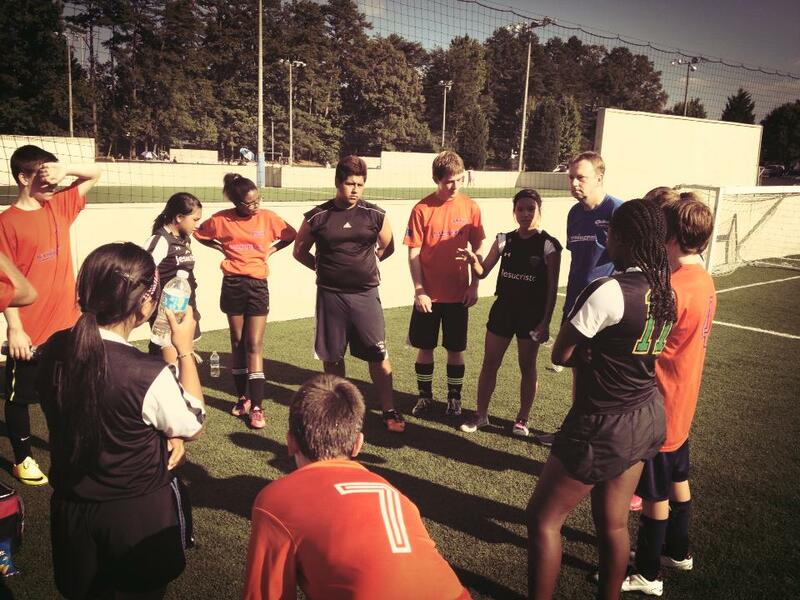 The One7 soccer program can also be utilized as a tool for discipleship, and we are taking full advantage of that fact. Being part of an athletic team is a unique experience, and we use our program to draw kids into an environment that honors Jesus first, above everything else. After each game, one of our captains shares his or her personal testimony with the other team. One of the leagues we play in is Strikers. They offer competitive play and also recreational. It’s 5 vs 5 and is usually very fast paced since we play on smaller fields with walls. We lost on Saturday, but shared and prayed with the opposing team afterwards. In everything we do at One7, our most important goal is to glorify God. Win or lose on the soccer field, we are out there to represent His name. If we take kids to eat dollar menu at McDonald’s, we glorify God. No matter what it is, from the biggest down to the smallest activity, we are constantly praising the One who continues to bless this ministry. We are nothing without Jesucristo. If you feel led to support One7 in any way, please click Here. This entry was posted in One7 and tagged argentina, bible, Charlotte, christ, community, ethiopia, faith, food, god, inner city, jesucristo, Jesus, ministry, News, one7, outreach, project, salvation, shelter, soccer, story, vietnam, volunteer, work on October 14, 2013 by one7blog. As Christians, it’s so easy for us to praise God when things are going great. We thank Him for our many blessings, another day of life, and for those wonderful people He destines to cross our path. During those times, we trust our Heavenly Father more than ever. We feel safe and confident that we’re doing His will. It’s like sitting in front of a crackling fire in the middle of winter with a big cup of hot chocolate. There’s no other place we’d rather be. We aren’t promised a life of comfort, fun, or undying happiness. At some point or another, hard times are going to come. A young mother grieving over the loss of a stillborn baby. A wife, with tear stains on her face, watching her husband walk out on her and the children. A family losing a son or daughter to war. A car accident that takes the lives of the parents, rendering five children orphans. The list goes on and on. These are events that can cause unbelievable pain and suffering. Praising God through the hard times takes unshakable faith. Faith that He has everything under control and knows what’s best for our lives. The month of September was very difficult for One7. Spiritually, emotionally, and financially. Satan constantly bombards us with attacks in order to weaken the ministry and attempt to destroy what God is doing. Here is a Facebook post last week from David, the founder and president of One7 Ministries. “As many of you know several trials hit us this past week. We were totally helpless and used the last bit of money we had today to fill the vans up with gas @ one7. We didn’t want to cancel one7 because of money. In faith we filled the vans with all we had. We knew that if we continued to praise God through the rough time we were experiencing, He would bless that, And, just as we had anticipated, He came through in a huge way by using the family from TN. Never stop praising our miraculous God. Even when all hope is lost. Even if it seems like the darkness is overpowering the light. Even when it doesn’t make sense. Even if the pain is so strong you don’t feel that you can bear it. God is always there. Always. This entry was posted in One7 and tagged argentina, bible, Charlotte, christ, community, ethiopia, faith, food, god, inner city, jesucristo, Jesus, ministry, News, one7, outreach, project, salvation, shelter, soccer, story, vietnam, volunteer, work on October 1, 2013 by one7blog. Pain. It’s an ever present part of life for some people, maybe even for most. Physical pain, emotional pain, spiritual pain. There are all types and versions, and none of us are immune to its presence. At One7, we see and experience pain on a regular, almost daily, basis. We work with youth from multiple origins, backgrounds, religious beliefs, and home situations. We are all broken, but understand that God loves us relentlessly, and His love doesn’t depend upon our condition. He often displays His unparalleled power through cracked and nearly shattered vessels. Sometimes the very definition of pain doesn’t entirely reveal itself until you’ve been at the lowest possible moment in your life. In that dark place where there is only one direction to go, and that direction is up. Most of the people we interact with at One7 have, at one time or another, been in that place. Some have overcome great adversity to be in this country. They have been forced to sacrifice everything, except the clothes on their backs, to escape persecution and flee their homes and everything familiar. They have left behind brothers, sisters, uncles, aunts, fathers, mothers, and grandparents. They have gone days, even weeks with no food. They have survived some of the worst refugee camps this world has to offer. After enduring all of that, they are then thrust into a strange land where the food, culture, and language are nothing like they are accustomed to. Kids struggle in school. Parents struggle to find work. There are moments when they wonder if leaving their homeland was, in fact, the right decision. It’s a constant battle against racism, rejection, homelessness, and peer pressure. They search for hope in a place where it’s sometimes very difficult to find. They end up at our doorstep, and that gives us the opportunity to show and teach them that there is only one person Who can change their lives. God is greater than the fear of walking into the unknown. God is greater than the empty food cupboard in the kitchen. God is greater than language barriers. God is greater than the intense pain of losing a parent. God is greater than all of that, because God. Is. Love. His unconditional love pierces through the darkest pain you could ever suffer, and fills your soul with His light. His love can break through the walls surrounding the street-hardened boy who has no father. His love can melt the jaded heart of a teenage girl who had to drop out of school to raise her baby. His love can heal the scars of past rejections and abuse. At One7, we are dedicated to sharing the Gospel of Jesus to everyone we meet. We believe that as the body of Christ, we are to be the hands and feet of Jesus and love others unconditionally. Is it easy? Not even close. Is it worth it? You better believe it. Please pray as we continue forward with this ministry despite the constant attacks from satan. He never stops trying to destroy what God is doing here in Charlotte, but we are confident that our God is greater. This entry was posted in One7 and tagged argentina, bible, Charlotte, christ, community, ethiopia, faith, food, god, inner city, jesucristo, Jesus, ministry, News, one7, outreach, project, salvation, shelter, soccer, story, vietnam, volunteer, work on September 23, 2013 by one7blog. What a weekend. We were scheduled to play four games, but one was cancelled at the last minute. The Fall season has kicked into gear, and we have several different teams that will be taking the fields. 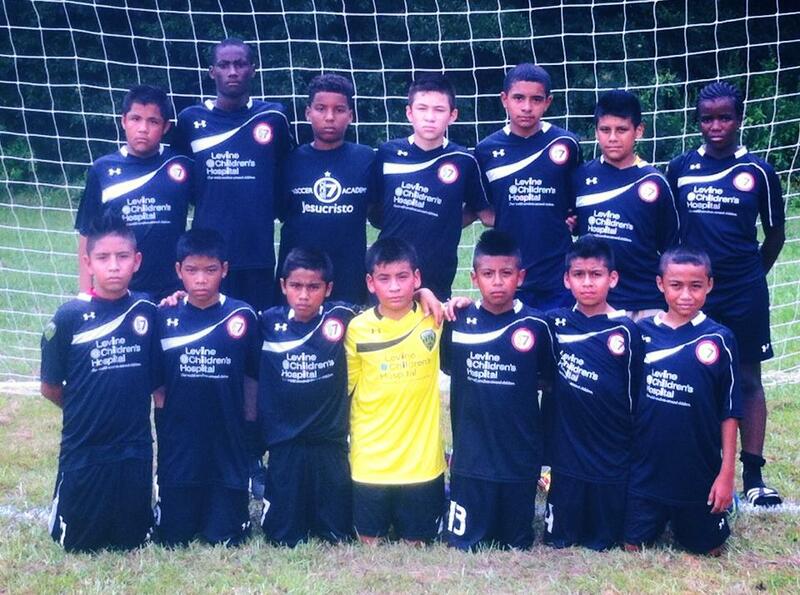 On Saturday, our U13’s played a great game and ended up walking away with a 9-0 victory. While it’s always great to get a win, our main focus is being examples for Jesucristo on and off the field. We demonstrate a passion for the game of soccer, but also excellence in our sportsmanship. We constantly receive letters and messages from parents of other teams talking about how amazed they are by our players. We had two games on Sunday. 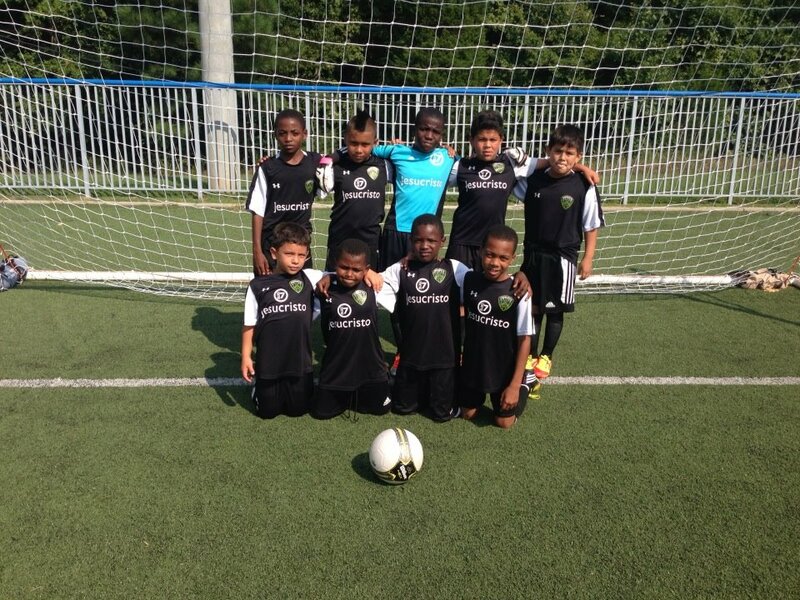 Our U11 team, which consists mainly of players who are starting to learn the game, ended up in a 6-6 tie. That is a huge accomplishment for this team. They played with real heart out on the field. We are expecting great progress from this team during the season. Not only are they trying to master the skills of passing, dribbling, and shooting, they are also learning how to unite as one team and play together. Most play in their apartment complexes where it’s pretty much every person for themselves. We teach them to trust the other members of the team and have confidence in each other. Also on Sunday, we had a team play at Strikers. It isn’t league competition like Charlotte United or US Club, but it gives the youth that aren’t on a league team the chance to play and gain experience. We took six girls and one boy to play and came out on top with a 10-4 win. After the game, one of our strongest leaders, Hyuien, shared about One7 and how we don’t play soccer for ourselves, but for God and we glorify Him in everything we do, win or lose. This entry was posted in One7 and tagged argentina, bible, Charlotte, christ, community, ethiopia, faith, god, inner city, jesucristo, Jesus, ministry, one7, outreach, salvation, soccer, story, vietnam, volunteer on September 9, 2013 by one7blog.